It came, it came! 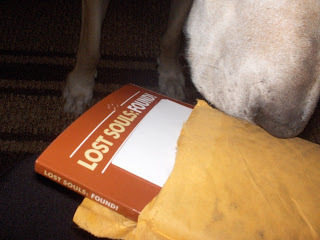 Mommy saw what was in the mailbox and went and got me. Look, it is here! We even checked the label to make sure it was THE BOOK! Hurry mommy, open it! I just gotta see it in print! It is! 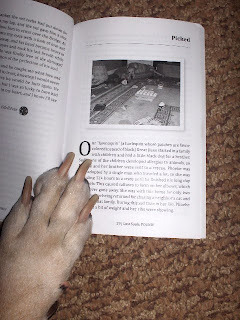 It is the book I am in! I can't beleive it! I am an arther! 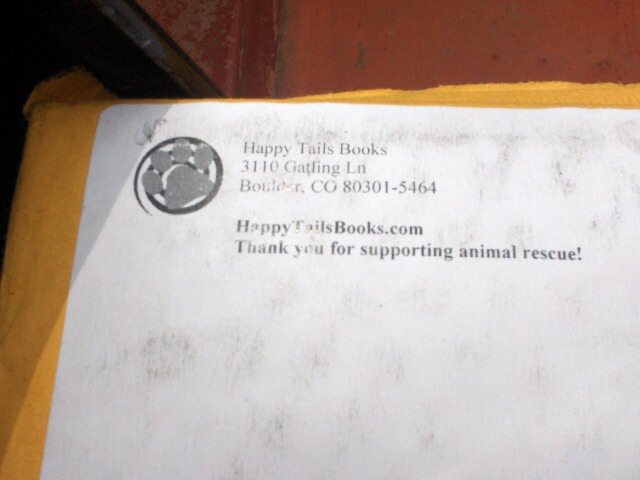 The books is by a company called HAPPY TAILS. 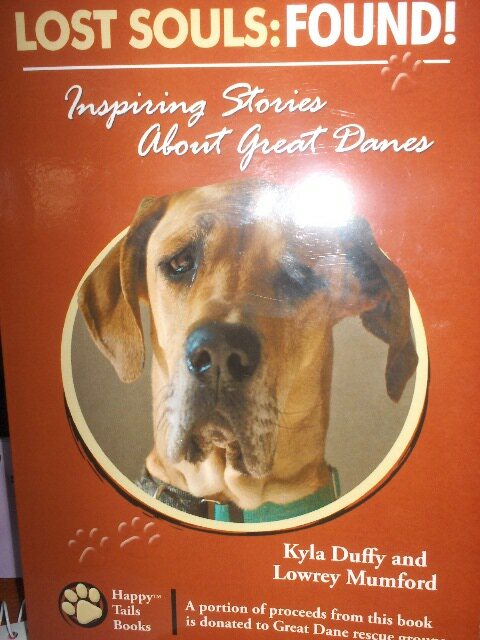 They write books about rescued doggies like me, and about all different types of breeds. 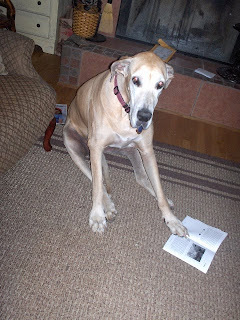 The proceeds of the books, go to rescue's to help save more doggies. There are a lot of stories in the book. If you want to help other doggies, go to their website: HAPPYTAILS and order yourself a book too. Mommy found my chapter right away. I can't believe it. Out of all the bootiful pitchers of me, she picks the one showing me being a bad girl. uummmpphh! But it still makes me famus. Here I am on page 29, for the whole world to read about how I was saved by mommy and daddy. And how I tot them how to be good owners of a Great Dane. This is my publicity pichure. 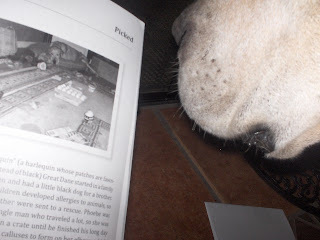 I am pawtographing the first book! 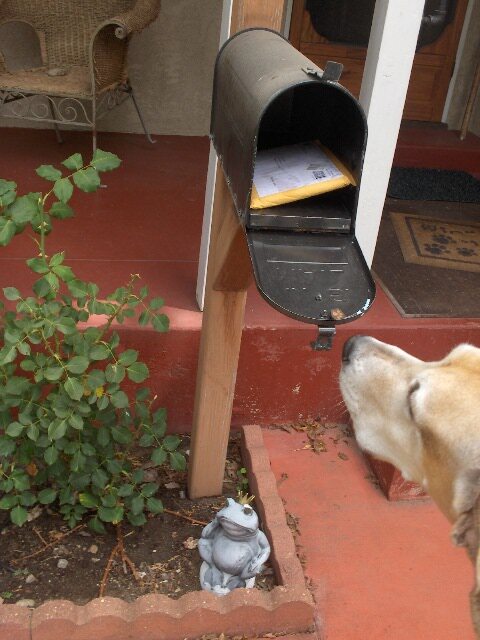 Do you want my pawtograph? 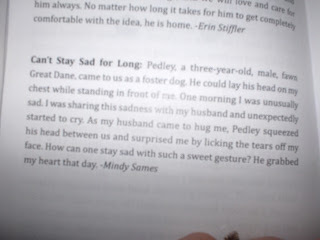 Also, my foster brother Pedley got a little famous. We havent heard from him since he left us, but he is still in our hearts. Mommy wants to go read the book now. She said will probably need the box of sniffie cloths, to wipe her leaking eyes while she reads it. Yay!!! Wonderful! That's so fun! I love that my bunnies are in the Disapproving Rabbits book so I can imagine the joy you feel! Thats great! Youre famous Sasha! That is awesome!!!!!!! Congrats super star!!! Congratulations. Always great to know a famous pup. WOW! We know a famous dog!!! Congratulations!!! Oh congratulations - Sasha - how exciting!! Oh dear, I am sorry they did not select a princess photo of you, but still, it is great that you got to share your story. Looks like a fantastic book. Congratulations on becoming famous. It sounds like a great book. 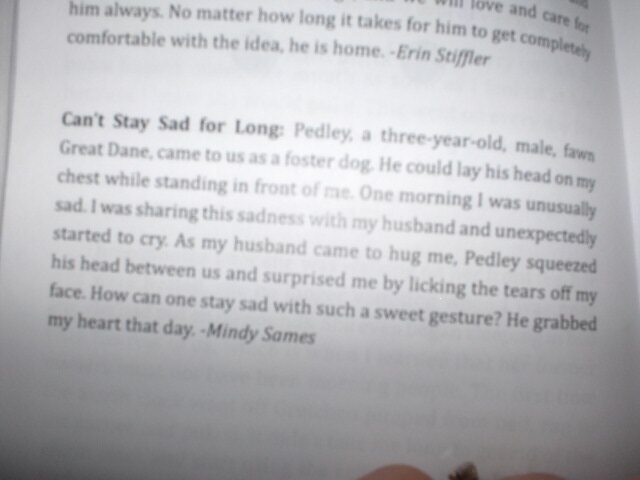 We're assuming Pedley was adopted and that's why you haven't heard from him.